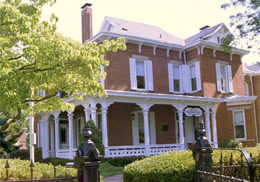 Delta Zeta is unique in that we live where we were founded – and not in a modern office building, but in a house built in 1884, just a few blocks from Alfa Lloyd’s home. 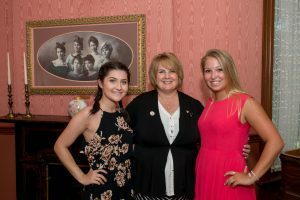 In our National Historical Museum in Oxford, Ohio, just down the street from the campus of Miami University, each room and its furnishings have something special to tell about Delta Zeta’s rich past and promising future. Ruth Weider Patterson – Beta Chi, Wittenberg University, serves as the Foundation’s Vice President-Museum, and works closely with National Headquarters staff to ensure that our history and heritage are preserved, displayed and celebrated. Attendees of the 2017 Norma Minch Andrisek Leadership Conference spent an afternoon touring the National Historical Museum and Headquarters. 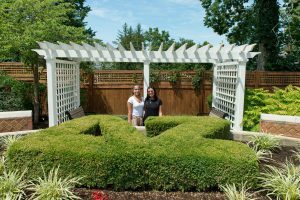 Areas of particular interest included the Founders Parlor, the Hall of Presidents and the large conference room, which contains the history of Delta Zeta’s beginnings on Miami University’s campus and the history of the Sorority’s earliest National Councils. Our story is about Delta Zetas who change the world through their leadership. 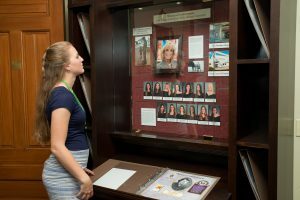 The Women of Achievement and Women of the Year rooms chronicle the stories of the women who have fulfilled the promise to live as global citizens and change the world through interesting exhibits. The emerging leaders who attended the Norma Minch Andrisek Leadership Conference were inspired by these women’s stories. It is truly an extraordinary experience to visit the National Historical Museum, but for those who cannot visit in person, we offer the Virtual Museum Tour, which is the next best thing to being there. Funded with a generous gift to the Foundation from former Trustee and 2005 Woman of the Year Jean Baughman Templeton – Gamma Sigma, Eastern Michigan University, the Virtual Museum Tour can be experienced on a computer or any portable device. Just go to the Delta Zeta website, scroll to the bottom, and select “DZ Museum” from the bottom menu. The virtual tour features detailed information about each room and its artifacts in the museum. There are 360 degree videos of the most popular rooms, Fun Facts and more extras. It will even take you outside to the beautiful Centennial Garden, dedicated in 2002. A white gate with a Roman lamp carved in the wood invites visitors to stroll inside. Across a brick pathway into the Centennial Garden, the names of donors who gave to the Centennial Campaign are engraved on plaques. Throughout every facet of the museum, the Delta Zeta Foundation preserves the past while laying the path for the future. Your generosity supports the work that the museum does to preserve all of Delta Zeta’s rich history for future generations and continues to allow others who cannot visit the museum in person to experience this unique history virtually. We thank our generous donors, who know that learning about Delta Zeta’s history prepares us to lead for the future.